This tool is not ready for usage yet, since not all commissioning steps are completed yet. The process is also tracked on GitHub. Feel free to contribute to making it usable, any help is very welcome! This tool will be a great addition for woodworking as well as other projects as it can also be used to grind metals. There are even advantages over stone-based grinders such as the larger surface and no chance of exploding stones. Belts may rip and go flying though, especially if they are installed in the wrong direction. This sander requires 76 × 457 mm belts. We only have a few belts, so be prepared bring your own! If the belt often slips under pressure, it may have become stiff - this may be fixed by "massaging" it a bit in tight bends or replacing it with a new one. although the belt sander can be clamped very carefully in a woodworking vise, we should really make a proper stand for such stationary uses! The Spanish Maker Román Palma shared instructions for a nifty three-position stand in Make: magazine, see the article and video here! 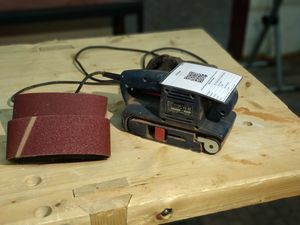 With such a stand we could use the belt sander as a simple substitute for a planer (DE: Hobelmaschine) or bench grinder. This page was last edited on 8 March 2019, at 23:45.